The Isleworth Mona Lisa has been known to experts for years, but they remain divided on whether the painting is by Leonardo or whether it shows the same woman. 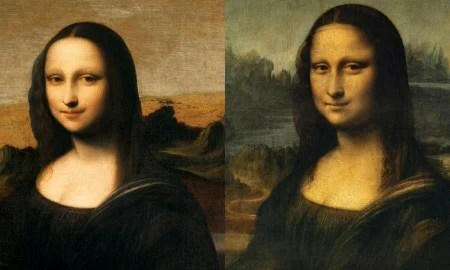 The foundations claims it was painted a decade before the famous portrait of Lisa Gherardini del Giocondo, who is thought to have sat for the painting which now sits in the Louvre between 1503 and 1506, based on regression tests, mathematical comparisons and historical and archival records. The Isleworth Mona had belonged with a British family for over 150 years, before being sold to art dealers in the 20th century. Since 1979 the painting has been left half-forgotten in a vault.